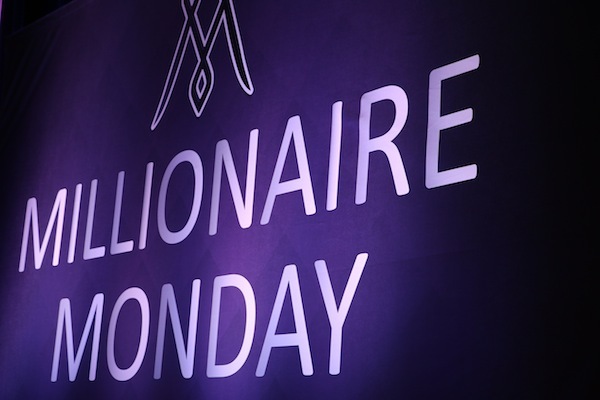 After struggling through the lengthy rapid qualifier yesterday, GM Hikaru Nakamura only had a spot of bother today at the Millionaire Monday four-person playoff. He drew his opening two games in the semifinal versus GM Yu Yangyi before winning in the shorter rapid tiebreaks, but then easily beat GM Le Quang Liem in the final to win the second edition of the Millionaire Chess Open. It was Nakamura's first win since the 2015 U.S. Championship but the largest chess payday of his career. 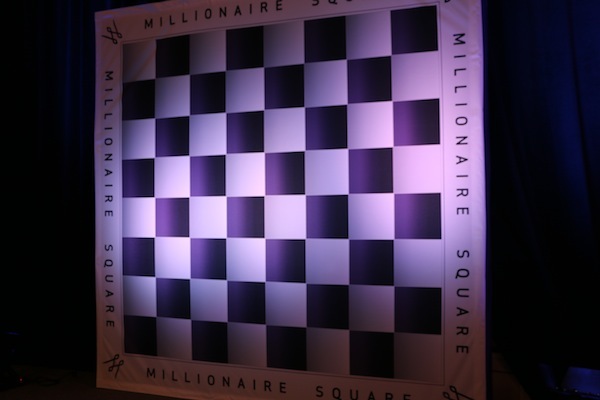 GM Hikaru Nakamura played in front of the Millionaire Square light board (scroll down for details on that). "The final was a bit anticlimactic," Nakamura told Chess.com. The winner has spoken so we'll cover the semifinal first. The afternoon's twin G/25 games (with a five-second delay) got Nakamura nowhere. Game one's Berlin was a whole lot of nothing versus Yu Yangyi, but as Black that wasn't a huge issue. After some of yesterday's issues, today's marquee event began on time and went off without a hitch. They turned around the table a few minutes later. Nakamura's hanging pawns turned into a backward pawn, which in turn became an isolated pawn. The transmogrification of the d-pawn wasn't enough to tip the scales though. White was worse only in a computer evalutation sense -- holding the position was quite easy. Meanwhile, GM Le Quang Liem wasn't having nearly as much trouble with the lowest-ranked player in the quartet, GM Aleks Lenderman. In game one his bishops carved up Black, one in the middlegame while the other saved energy for the endgame. What's Vegas without some poker? Second from left in the crowd is FM Ylon Schwartz, a World Series of Poker bracelet winner. GM Le Quang Liem grabs a celebratory glass of water with teammate GM Ray Robson (left) and coaches Paul Truong and GM Susan Polgar. Le Quang Liem got to rest while Nakamura and Yu Yangyi went back at it in G/15 games. The two repeated their Berlin and White again got the bishop-for-knight imbalance, but with one salient difference this time: the lack of center pawns gave the bishop much more range. White missed a chance to create more problems for Black than he did, but it was debatable if the position was ever winning. Another musical chairs interlude followed, and with Nakamura again helming the White pieces, he had knight for bishop for the third time in four playoff games. Unlike the first two, this knight was up to the challenge. GM Yu Yangyi reluctantly trusts that Nakamura knows his rook-and-pawn basics. The players recessed for several hours until 5:00 p.m. for the first-place match, which followed the same procedures. Yu Yangyi and Lenderman played for third place. Nakamura took White in the opener and his thrust 23. d5! released the cork on his pieces' energy, and for practical purposes, his victory champagne. 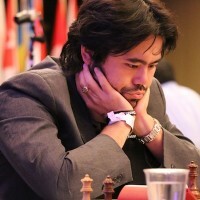 Nakamura often checks his analysis by looking away from the board. Le Quang Liem called this the "big moment" of the match. "The final I played well," Nakamura said. "I kind of tricked Le Quang in the first game in a system he wasn't quite familiar with. I was able to find some fast moves and gain some time on the clock." Le Quang Liem had to beat Nakamura in the rematch to stay alive, not an enviable situation to be in. Curiously, Nakamura played the same line as Black that GM Pavel Eljanov used to deny Nakamura's comeback in their FIDE World Cup match last month. "I was kind of marginally worse," Nakamura said about the game. But then he drew a distinction between players like Yu Yangyi and Le Quang Liem and Magnus Carlsen and himself. He explained that all four of those players can get an advantage, but the world's top two don't let chances slip. Nakamura told Chess.com he started feeling unwell around round five. He was sniffling again today. 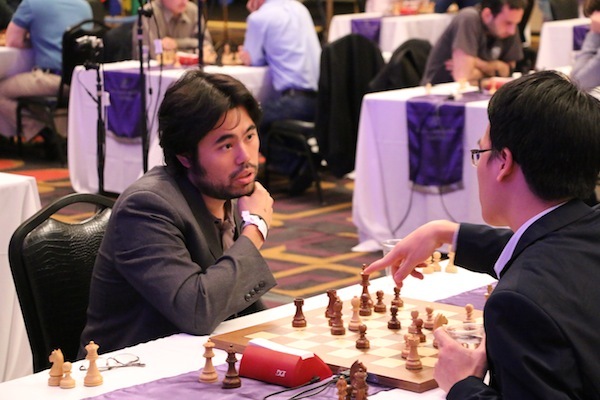 Nakamura grimaced when White's bishop and knight landed in his territory. After some thought, he summarily sent two White pieces backward, and tried to trap the third. "Once I saw this ...e5 idea, it wasn't bad," he told Chess.com. Although he's completely winning in the final position, White has almost no comeback ideas, so Nakamura conceded a draw to clinch first place. "It's very difficult," Le Quang Liem said about playing Nakamura in a fast time control. "Hikaru is a great blitz player." The Webster University junior won half as much but had twice as big of a smile as the winner. The $50,000 payday also deprives this report from making a fancy headline -- there is a Vietnamese word for specifically for "100,000" (instead of the English pronounciation which is a combination of the numbers "hundred" and "thousand"). "I couldn't even imagine I would be in second place," Le Quang Liem told Chess.com. He said that going pro after college was still only a "possibility." 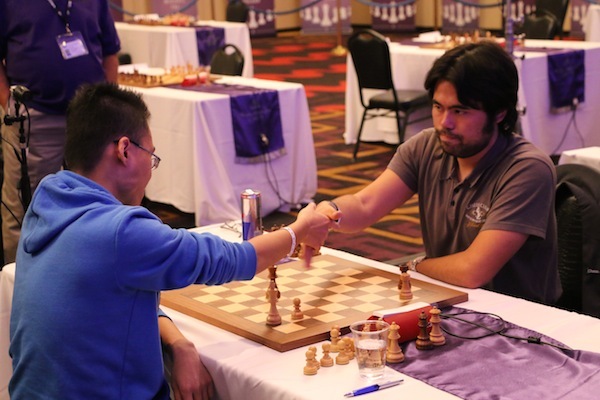 Nakamura and Le Quang Liem discuss their two game mini-match. How about the champion? He's been pro for a while now, but is experiencing the most accomplished year of his career. "I'll probably go eat a nice dinner with Kris," Nakamura said, referring to his second, Kris Littlejohn, who rejoined the Nakamura team recently after a hiatus. "It's very important you have a good conection with whoever you work with," Nakamura explained. "When you have that kind of chemistry it helps." The pairing is working well. 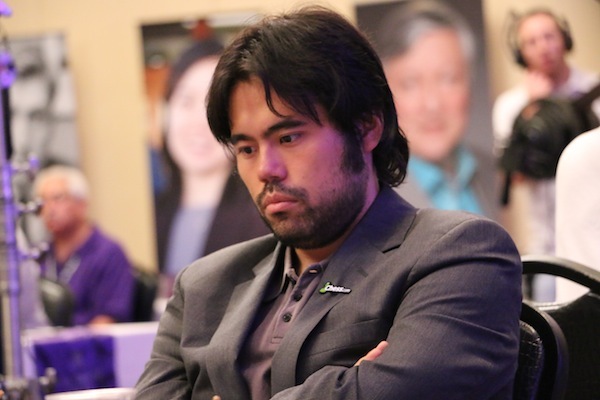 Nakamura's 2015 has now included wins in Gibralter, Zurich, St. Louis and now Las Vegas, in addition to qualifying for the 2016 Candidates Tournament through the FIDE Grand Prix. He told Chess.com that his decision to play in Las Vegas instead of the 2015 World Rapid and Blitz Championship wasn't really a decision at all. 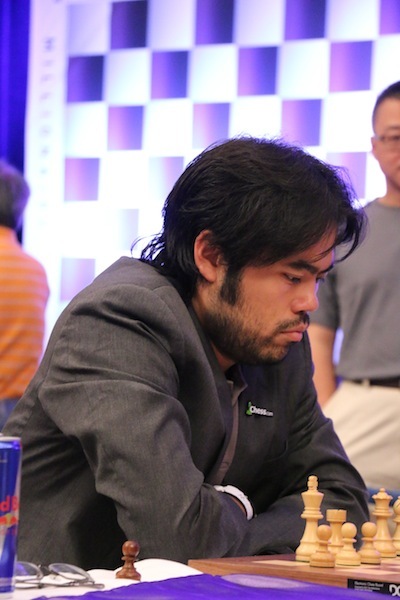 Nakamura registered for Millionaire Chess while still playing in Gibraltar back in January. "I thought the blitz and rapid would be in June," he said. Financially, it turned out to be the right decision. Even a double-win in both events in Berlin would "only" earn $80,000, which is 20 percent less than his giant check will read from Las Vegas. Nakamura insisted money wasn't important -- he said he'd save and invest most of it. The only thing left to decide? Who amongst the nine section winners (of which Nakamura is one) would win the trivia contest and get a one in 64 chance to pick a sqaure for one million dollars? Chess.com will update this report later with the chosen square and some pictures from the closing ceremony. What is more important to Nakamura? On the commentary, he said, "I want to prove that I'm the strongest American player." In the third-place match, Lenderman lost both games again to go down to Yu Yangyi. "I'm not a very good rapid player," Lenderman said, though he was pleased that he played better than in his rapid playoff with GM Varuzhan Akobian at last year's U.S. Championship. 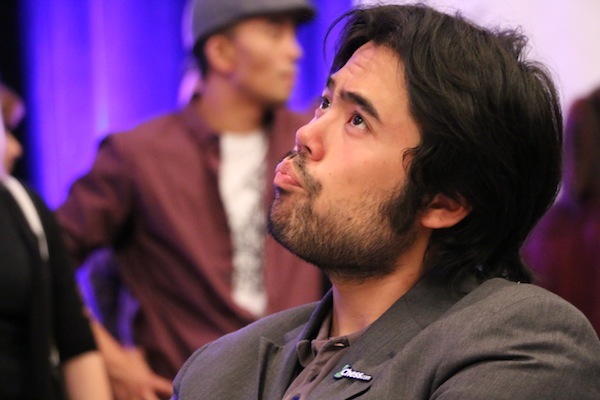 With all the tournament wins, does Nakamura think he could win his first-ever Chess Oscar at year's end? "It's either me or Magnus," Nakamura said. 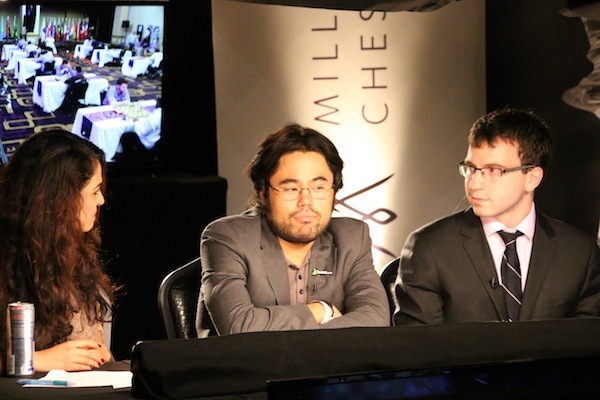 Nakamura is interviewed by IM/WGM Tania Sachdev and GM Robert Hess. How has he made 2015 a career year? Nakamura said chess fans may not like the answer: "I'm much more relaxed. I don't tend to worry as much. That almost sounds like I care less...I'm pretty happy-go-lucky." And now so is his bank account. 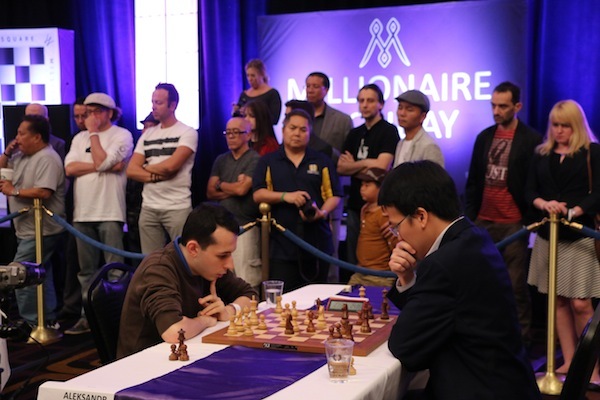 At the time of this reporting, the larger field was still playing for "fifth place" -- GMs Fabiano Caruana, Wesley So and Luke McShane all headed into round nine with 6.5/8.